In a small town in Maine, a writer (David Soul, TV’s Starsky & Hutch) discovers that a vampire is slowly turning the town’s residents into creatures of the night. Author Stephen King’s breakthrough novel, Carrie, was turned into a financially successful movie in 1976. It came as no surprise to anyone that King’s next book, Salem’s Lot (short for Jerusalem), was quickly nabbed by a film production. I was glad that they decided to adapt it into a mini-series because the plot-heavy book wasn’t really suited for cinema. Despite the inherit limitations of the small screen, Salem’s Lot quickly became a sensation and holds up rather well at 40 years. The script was written by Paul Monash, who was also responsible for producing Brian De Palma’s Carrie. The producers hired indie filmmaker Tobe Hooper, who had made a big splash with The Texas Chainsaw Massacre, to helm the project. The show is much slower than today’s TV product — ADHD wasn’t nearly as prevalent as it is today — and, in my opinion, that’s a good thing; characters are properly fleshed out and the narrative is fully-developed. Salem’s Lot was originally aired over two nights. I was in Elementary School when the show aired on my local TV station and I remember being scared to death. My friends and I couldn’t stop talking about the show. Trust me, those two nights I made sure there was nothing under my bed. Times have changed, but I’m almost sure that most modern viewers will enjoy the film’s many wonderfully creepy moments. There are many scenes that still give me the willies. 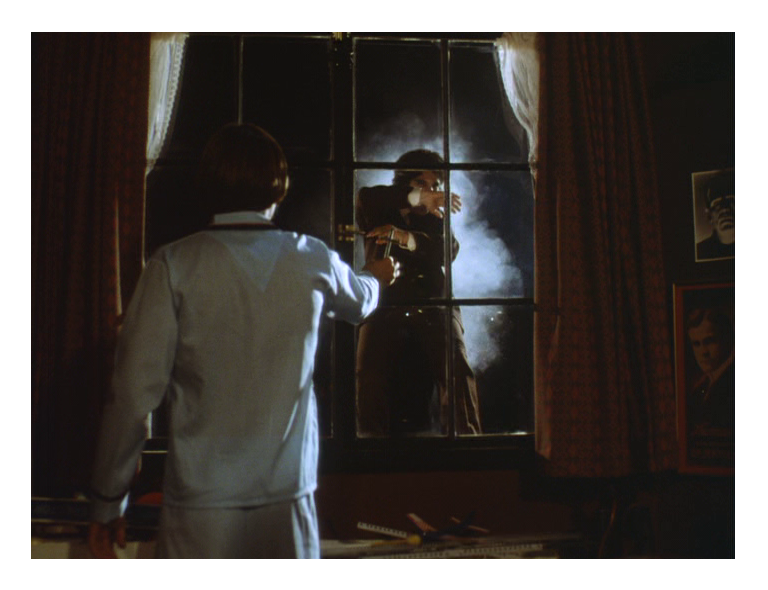 Most people remember the scene of the vampire kid knocking on the window at night, but my favorite scene involves the main vampire flying through the kitchen window. A priest confronts the creature with a crucifix and let’s just say that things don’t turn out well for the man of the cloth and his parishioners. Like most Hooper movies, Salem’s Lot is packed with references to other films — movie buffs will have a blast figuring out the homages. The vampire’s appearance pays tribute to the 1922 classic Nosferatu (this isn’t the way King describes the vampire in his book). My favorite is the tribute to Stanley Kubrick’s The Killing. Elisha Cook Jr. and Marie Windsor, who play a troubled couple in Kubrick’s 1956 crime masterpiece, seem to be reprising their old roles here. James Mason’s (20,000 Leagues Under the Sea) old-world elegance — he plays the vampire’s faithful servant — is the best thing about the TV show. That voice of his! Mason hisses his line with sinister gusto — I found him scarier than the vampires! Mason does more with an eyebrow than most actors do with their whole bodies. I even liked the way he walks — he trots through the sets with the irresistibly self-confidence of a malevolent fiend who knows he has the upper-hand. This is what great acting is all about! 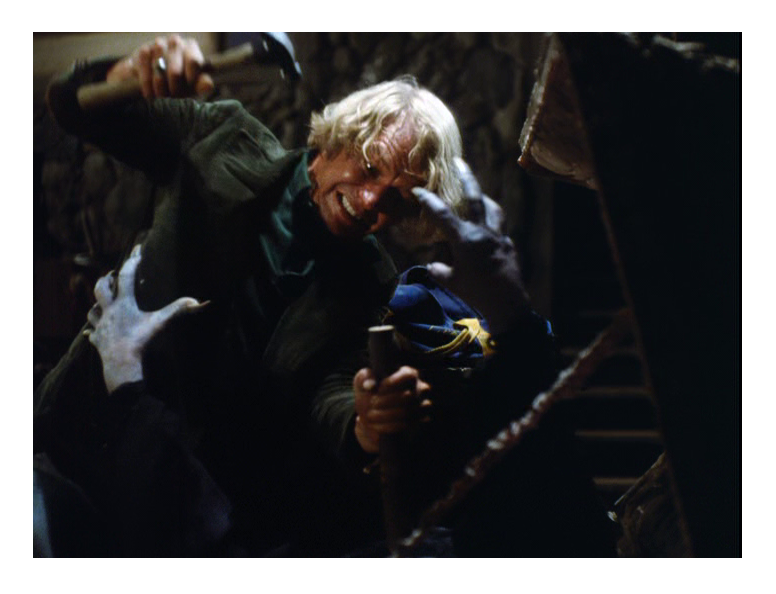 David Soul is fine, but he has trouble keeping up with Mason. The film also features Lew Ayres (Johnny Belinda) and Bonnie Bedelia (Die Hard) as teachers, Kenneth McMillan (Ragtime) as the town’s sheriff, Fred Willard (Best in Show) as a real estate agent, and Ed Flanders (MacArthur) as the town’s doctor. Reggie Nalder (1956’s The Man Who Knew Too Much) is unforgettable as master vampire Barlow. 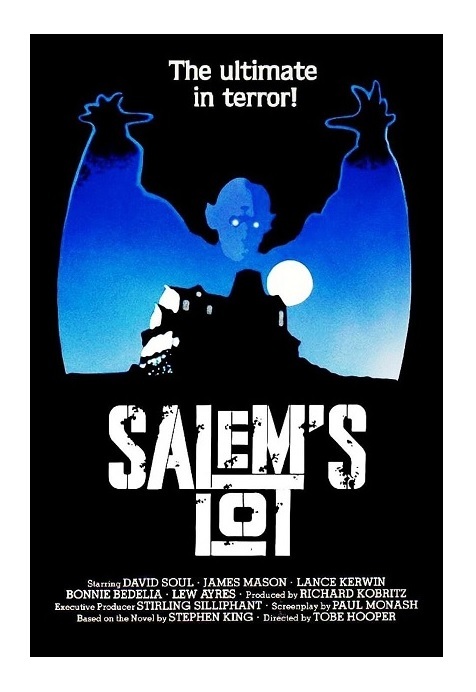 Salem’s Lot proved to be so successful that it was re-edited and released in theaters in Europe (it was released under the title Salem’s Lot: The Movie). The shorter version (112 minutes) was released on VHS. 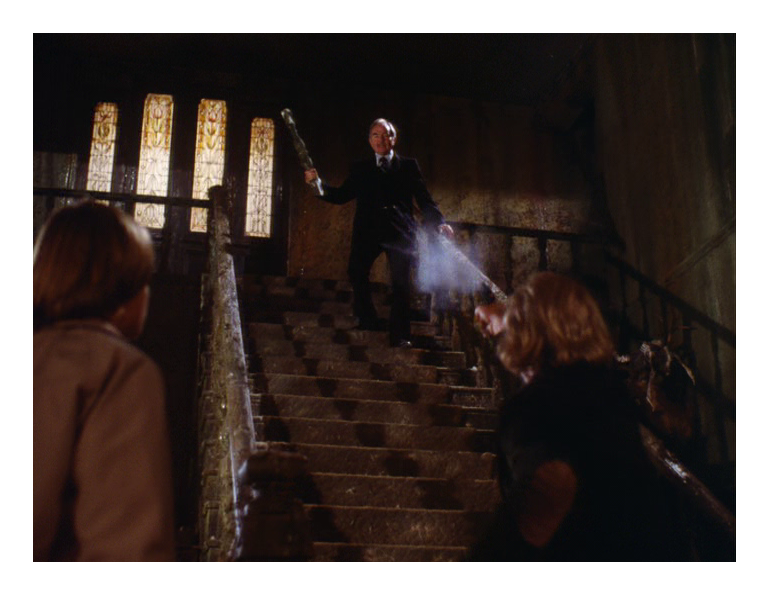 Anyhow, while Salem’s Lot has lost some of its edge, the mini-series is still lots of fun. The 3 hours feel like a breeze — fun-times always seem to go by faster! The show made some changes to the book, but I’ll always consider it one of the most effective King adaptations. Followed by an unrelated sequel, Return to Salem’s Lot. Remade in 2004, starring Rob Lowe. Color, 184, Rated PG. P.S. This is my contribution to The James Mason Blogathon, hosted by Maddy Loves Her Classic Films. Ha-ha-ha! I think we had same nightmares! Great review of a miniseries I remember enjoying both on its original run and when the Syfy channel aired it again in recent years. Wasn’t Lance Kerwin of James at 15 fame in it it too? You are right! I should have mentioned Kerwin. He could have been Mark Hamill’s brother! Sadly, his fame didn’t last long. I remember when this first aired as well. I was petrified but I couldn’t turn away. Now, that is must-see TV! Love your description of James Mason in this mini-series. He was perfection. Terrifying series! That scene where the boy floats outside the window is seriously creepy. This is one of the better Stephen King adaptations in my opinion. To me good horror isn’t about gore and shocks, but about creepy/unsettling atmosphere and physiological horror. James Mason manages to be both funny and sinister at the same time. His performance remains in my mind after watching this. You are so right in your description of his acting ability. Truly one of the greats. Thanks for joining me to celebrate James. My pleasure. I’m so glad you had fun taking part. That should have read as psychological horror. What a lovely article! This is one of my favourite Stephen King books, and as you say, it’s definitely one of the best adaptations of one of this works. James Mason is incredible in it. I particularly like how the TV series managed to preserve a lot of the creeping dread that was such a memorable part of the book. Really enjoyed your take on things.